Teaching children about good character can be fun! 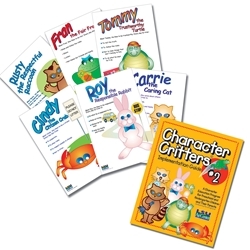 Character Critters Kit 1 is a character education resource designed for early childhood educators and others who work with 4-year-olds and 5-year-olds. It is a story and activity approach to teaching character. There are six individual stories that feature six cute critters learning about good character. There are 30 storytelling posters with story illustrations on one side and the story script on the other – for easy storytelling. The kit also includes an implementation guide that provides suggestions for ways to implement the program, the six stories, parent-child activity sheets, lessons for parent meetings and activities to complement the storytelling.